Figure 1. 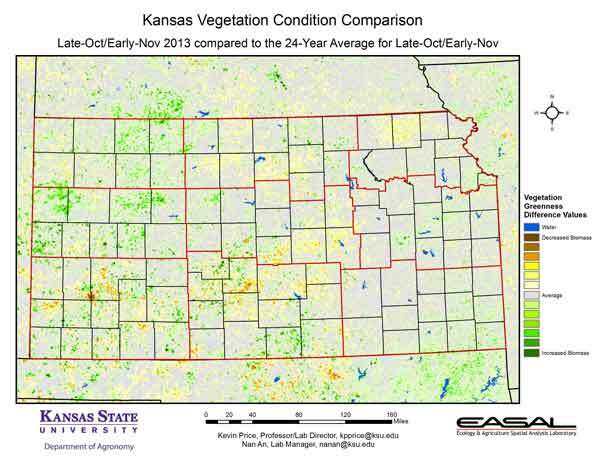 The Vegetation Condition Report for Kansas for October 29 – November 11 from K-State’s Ecology and Agriculture Spatial Analysis Laboratory shows that vegetative activity has slowed throughout the state. All locations have had a hard freeze, and only cold-tolerant plants remain active. Soil temperatures have also declined, with freezing values at the 2-inch depth as far east as Silver Lake and Rossville in Shawnee County. Soil temperatures in the southern areas of the state are still above freezing at the 2-inch depth. Figure 2. 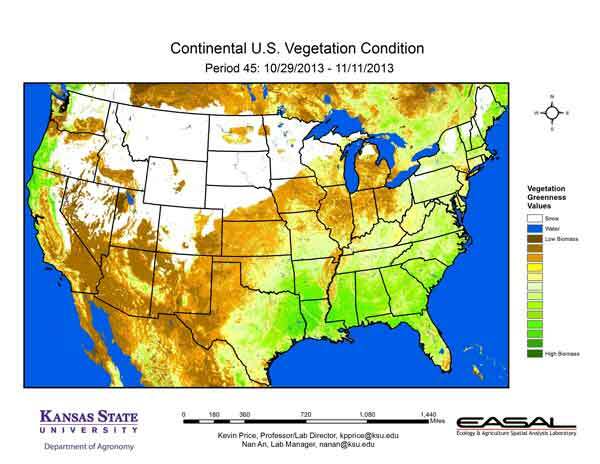 Compared to the previous year at this time for Kansas, the current Vegetation Condition Report for October 29 – November 11 from K-State’s Ecology and Agriculture Spatial Analysis Laboratory shows that the northwest and south central areas have the greatest increase in photosynthetic activity. These areas have had more moisture this season than last, with more favorable temperatures as well. In contrast, moisture in the East Central Division was more limited this year, and vegetation is more limited. Figure 3. 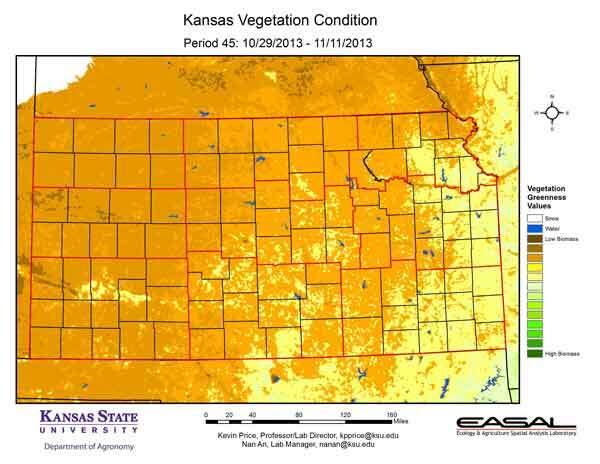 Compared to the 24-year average at this time for Kansas, this year’s Vegetation Condition Report for October 29 – November 11 from K-State’s Ecology and Agriculture Spatial Analysis Laboratory shows that most of the state is very close to normal photosynthetic activity. Some above-average values are still being seen in west central Kansas, particularly in Greeley and Wallace counties. Figure 4. 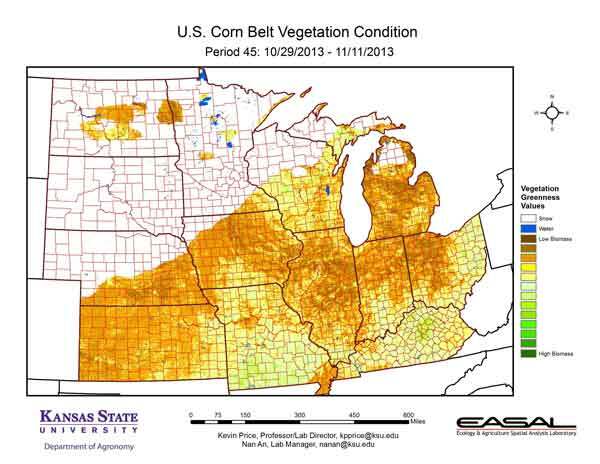 The Vegetation Condition Report for the Corn Belt for October 29 – November 11 from K-State’s Ecology and Agriculture Spatial Analysis Laboratory shows that active biomass production has mostly ended. Snow has become a feature in the northern portions of the region. However, the snow pack has persisted only in northern Minnesota, the Upper Peninsula of Michigan, and northern Wisconsin. Figure 5. 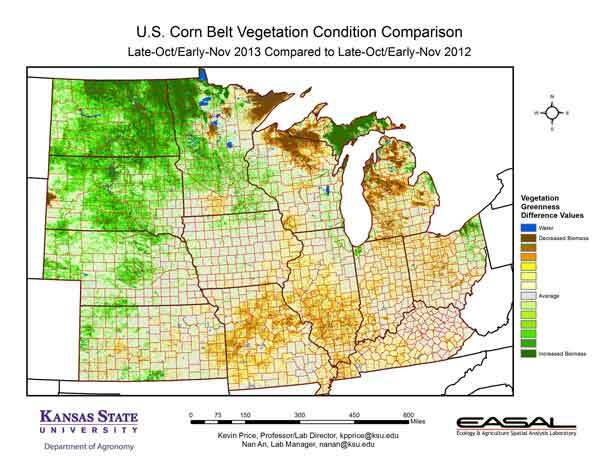 The comparison to last year in the Corn Belt for the period October 29 – November 11 from K-State’s Ecology and Agriculture Spatial Analysis Laboratory shows that the northwest portions of the Corn Belt have much higher biomass productivity. The area of reduced activity in western South Dakota, due to the impact of the early blizzard, is still evident. In the southern and eastern areas of the region, an earlier end to the growing season has resulted in lower production values this year. Figure 6. 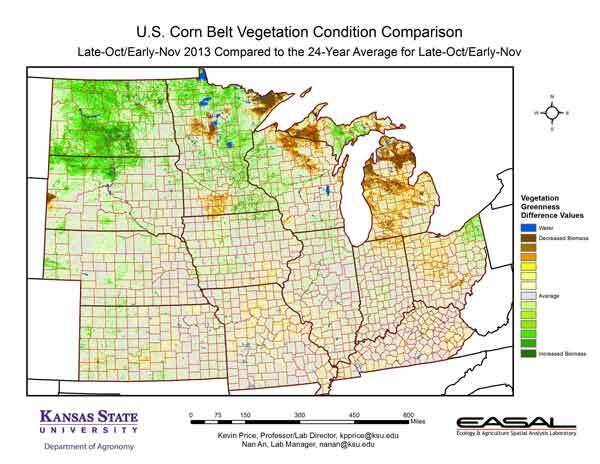 Compared to the 24-year average at this time for the Corn Belt, this year’s Vegetation Condition Report for October 29 – November 11 from K-State’s Ecology and Agriculture Spatial Analysis Laboratory shows that much of the region is close to average activity. The departures are most evident in the northern portions of the Corn Belt. In the western part, more moderate temperatures and favorable moisture have allowed for above-average biomass production. Excess moisture has been a problem in Michigan and Wisconsin. Figure 7. The Vegetation Condition Report for the U.S. for October 29 – November 11 from K-State’s Ecology and Agriculture Spatial Analysis Laboratory shows that snow has continued to have a presence in the western portions of the continental U.S. Most of the continued vegetative activity is in the Southern states and along the West Coast. Figure 8. 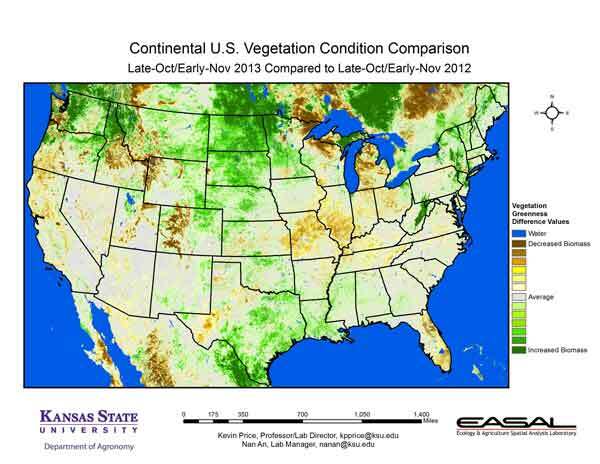 The U.S. comparison to last year at this time for the period October 29 – November 11 from K-State’s Ecology and Agriculture Spatial Analysis Laboratory shows that the Central and Northern Plains have the greatest increase in biomass production. Pockets of low activity are visible in the northern Mountain West, where early snow pack has developed. Figure 9. 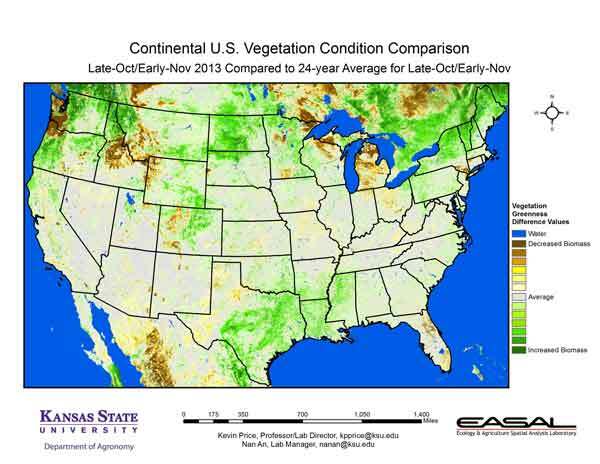 The U.S. comparison to the 24-year average for the period October 29 – November 11 from K-State’s Ecology and Agriculture Spatial Analysis Laboratory shows that most of the continental U.S. has average productivity. The highest levels of above-average photosynthetic activity are along the northern portions of the U.S., with the exception of areas where excess moisture and early snows have impacted vegetative activity.